Horse joint injections are all too common in today’s equine world and one of the main reasons why I opted to go to the opposite side and seek alternative options, as a veterinarian. The most common reason for use of a joint injection is joint disease, arthritis, with the intent or purpose to alleviate pain and prolong or improve performance. In many, use of a joint injection is warranted in one horse while in another, not so much. In either case, if we do decide to go that route, with an injection, you need to understand the pros, the cons and what options are before you to help extend the effects of those injections. After all, a joint injection is not cheap and does not come without harm. Equine arthritis and joint problem are on the rise and are often associated with increased usage, as in competition and training, but also come as a natural part of the aging process. In terms of joint problems, the main one we are referring to is osteoarthritis or degenerative joint disease (DJD). This is a common problem and results in degeneration, remodeling and loss of function to varying degrees in certain joints. The condition can impact one joint, specifically, or more commonly, impacts several at a time. We tend not to ‘see’ this last point, and more so tend to focus our efforts on the joint that tends to be the most obvious or most painful. What causes that horse joint to go bad? A joint that is degenerating is undergoing an inflammatory response, which is a cellular response that results in loss of joint fluid, cartilage and eventually bone remodeling. It is an inflammatory reaction within the body and in many cases, more specifically targeting certain joints. This process of inflammation leads to obvious pain, as in lameness, but is also present to the unseen eye, on a cellular level. This ‘unseen’ level was actually present far before any joint damage or even joint fluid loss began to occur clinically. Again, we just fail to see it. In most horses, the joint or joints are simply undergoing excessive strain due to training or competition or even specific moves such as slides or turns. In reality, the joints were meant to take a lot of abuse, but this repeated and often abnormal movement, puts excessive strain on the structures, resulting in heat or inflammation. When that process continues and gets out of control, then we begin to see cellular damage take place. In some horses, we have contributors that add to the problem, such as conformation, poor foot balance or travel and even aging. Many aged horses have compounded problems, as they have led a life of competition and strain, with degeneration, then add the process of aging to the mix. The icing on the cake for many unfortunately. The odd thing here is that many of these retired, aged, competitors were given therapy during their careers, but then left high and dry once they reach retirement. The main time when they could use some assistance, they are often left out to pasture. What is a joint injection and its purpose for my horse? Given the nature of equine degenerative joint disease, our goal in therapy is to reduce inflammation, which is the root process behind the condition. There are many options to achieve this goal, but joint injections seem to be the favorite for many reasons. First, they are quick in terms of performing and often rapid in regards to improvement. Second, they are also a nice stream of revenue for many veterinarians. In many cases, horses are started on joint injections at the first hint of a lameness, often without fully investigating the problem or even contributors such as poor shoeing, foot balance or even diet. The horse is started with one injection, then often leads to more injections, become more frequent as time goes by. Some are injected annually, while others I have seen, are injected monthly. Sad fact, but the process becomes addictive to an extent. The injections rarely solve anything, but more so are putting a band-aid on the process. Over time, the conditions continues, degeneration worsens, and the need for more frequent injections ensues. Most joint injections are a combination of a steroid (methylprednisolone or triamcinolone) combined with hyaluronic acid (HA). The steroid helps to mitigate the inflammatory process and the HA has the goal of improving the joint fluid situation. Some veterinarians will add in an antibiotic for good measure to help protect against infection. In most cases, a single joint is injected, while in others a series of joints is addressed. Are there any concerns with joint injections in my horse? Yes, nothing is without harm, no matter how routinely it is done. In many cases, the joint injection simply doesn’t benefit the horse, so you have loss of monies applied to that therapy. No guarantees with anything and in some cases, the joints is hard to inject because of the level of arthritis deposited. Other potential problems that are serious include infection and needle breakage. Infection is a real, although not common risk to joint injections. The joint, no matter which joint, is a sterile and ‘sacred’ place. When you introduce a needle, you are violating that space and potentially introducing bacteria into the joint. If an infection occurs, it can be really serious, resulting in a career ending, permanent lameness in some cases and even euthanasia in others. It is nothing to be taken lightly, but one reason why some vets do include an antibiotic with their injection. Not completely preventative, but it does help reduce the risk. Needle breakage is another uncommon, but yet serious situation. 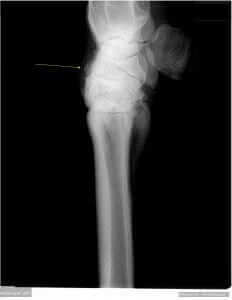 This is when the horse usually moves or shifts during the injection, and simply, the needle breaks off, leaving a sharp metal fragment in the joint space. This is a major problem when it occurs and often results in surgery, which comes with its own risks. The final comment regarding joint injections is that in some studies, their use, specifically steroids, may actually encourage further joint deterioration. In some cases, it seems the joint degeneration gets worse over time, which may partially explain why so many horses become increasingly dependent on their use. We also have to remember that rarely is just one joint impacted in any lameness condition. You may just ‘see’ sore hocks, but likely that horse’s stifles and even SI region are painful. If it has been going on long enough, likely we have soreness in the front end as well. A joint injection to the hocks is not going to address the other painful areas, as the injection is more specific and local. Again, joint injections are not a cure, they are a band-aid. Are There Better Options for Horse Joint Pain Management? There are always options when it comes to any health condition, including joint disease. We just tend to gravitate towards the most popular option, either used by our friends in the barn or because it was recommended by our veterinarian. In any situation, I think it is always best to take those recommendations home with you, take time to think them over, research and decide for yourself what is the best route to go. Keep in mind that this is not about you, but about your horse, your companion. The other question is what is the end goal and also the future of the horse? For many, they just want to get through this season of competition, then maybe sell the horse. For others, their horse is their life long companion. Either way, we need to look at the future. We have to remember that joint disease is an inflammatory process and often has ‘contributors’ adding to the situation. If we have a lame horse, using sore hocks as an example, we have to look at the entire animal. Evaluate conformation. Evaluate the shoeing and hoof balance. Do you have problems there? In 75% or more, there are problems and we know it. In most we have been ‘dealing’ with the foot issues for many years with special shoes etc, but now as a result have joint problems. You need to fix those feet issues if you want an optimal outcome. If you just choose to inject the joints, you will continue to have ongoing problems. In many, if you correct the foot issues, the horse actually gets better, without injections. Quite incredible in some cases, but also logical. A woman that wears high heel shoes all day long will experience knee and hip pain, but have her wear tennis shoes and the situation dramatically improves. Aside from joint injections, you have other options which include NSAIDs or non-steroidal anti-inflammatories. Generally, they are safer and more cost effective, but still yet, don’t offer the level of relief that many are desiring. They can be very helpful though in many cases, even when combined with other therapies, such as injections or herbs, helping to extend the level of relief. Sometimes, a course of NSAIDs is a better first time option than jumping into the boat of injections. We have discussed alternatives to joint injections in another article in more depth. Herbs…can they be helpful? Absolutely! Herbs have been researched for years regarding their ability to impact the inflammatory process. Often, what we see is that they do it more completely than any medication or injection, and without side effects in most cases. Medications, even NSAIDs and injections, are very specific in their actions on inflammation, often targeting only one or two aspects of a million piece puzzle. They can have side effects, sometimes serious, due to this level of specificity. Herbs give us new options, sometimes better options, to manage that clinical problem and give us a chance to alter that horse completely, on a whole body level. Through the proper use of herbs, at correct doses, you can impact your entire horse, hitting almost every area impacted by inflammation, not just one joint. They can be used proactively to prevent or slow processes, or used after the effect to aid in the management of a current degenerative condition. Herbs are the main approach that I choose to use in our patients, above and beyond typical injections. Through the use of specific herbs, often in combination and at higher doses, we can many times intervene earlier in the process, potentially slowing or even preventing the degeneration to begin with. In those patients that are undergoing joint injections or even on NSAIDs, we can put herbs into the regimen and potentially extend the life of those injections. It is quite possible that instead of injecting a horse every 4-6 months, you may be able to inject once a year with the right herbal approach. Many herbs are beneficial, including curcumin (turmeric), boswellia, dandelion, and many others. In fact, almost every herb has demonstrated the ability to impact the inflammatory process, but some are just more stronger and well researched than others. The bottom line is that you do have options and many yet are to be discovered. You don’t have to view joint injections and even medications as being something you have to do. These therapy options do have their place in horse joint disease therapy, but shouldn’t be the only choice available. In fact, as a veterinarian, I have not injected a joint in about 10 years due to seeing the true benefits of other options and also through the correction of contributing factors. Injections and medications comes with some serious risks, not to mention cost. They are warranted in many cases, but not in all. Even in those that they are warranted, we can often extend their efficacy through correction of contributing factors and proper implementation of herbs. At Nouvelle Research, Inc., we are here to help. If you have questions, please let us know. Why Is My Horse Fat?